The NEC 1091005 DSX-80/160 16 COIU supports 16 analog loop start CO lines. The card has a Mode Switch (for taking the card out of service), a status LED indicating proper card operation, and a port activity LED that indicates traffic on the card. 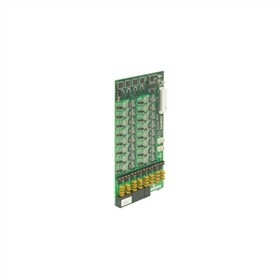 Each 16 COIU Card also provides two power failure cut-through circuits. When commercial AC power fails, the Card automatically cuts through two line circuits to two power failure single line telephones. The NEC 1091005 has many exciting features for users of all types. The NEC 1091005 is sold as a Brand New Unopened Item.